The Carroll County Farm Museum, located in Westminster, Maryland, provides the public with the opportunity to experience mid-nineteenth century rural life. The Carroll County Farm Museum, the first of its kind in the State of Maryland, opened its doors to the public for the first time on August 13, 1966. The Museum grounds include original farm structures, such as the Farmhouse and a bank barn, built in 1852-53. Other buildings include a 1700s Log Barn, Smokehouse, Broom Shop, Saddlery, Springhouse, Living History Center, Wagon Shed, General Store exhibit, Firehouse, and a One-room Schoolhouse. Period artifacts and antiques complete the rural experience for visitors. A guided tour through the seven decorated rooms in the Farmhouse is provided. The Large Hall Showcase and Bowfront China Closet in the Farmhouse feature special displays and collections which rotate bi-monthly. A self-guided walking tour pamphlet, push button recordings, and signage provide the visitor with information in the various exhibit buildings. Present exhibits support the Museum by presenting artifacts with appropriate interpretation, both to show how they once looked, and how they were utilized by farmers and their families in the history of agriculture in Carroll County. Visitors are given the opportunity to explore the Museum’s collections of horse-powered machines and farm implements used for plowing, planting, and harvesting during the 19th Century. From the moment you set foot on our historic door step, you’ll be swept back to the 1880′s. Thousands of “old store” items representing a lifetime collection are on display in this original Drugstore and General Store. From the original pine floors to the embossed tin ceiling you will know what it felt like to be a customer of W. R. Rudy, Druggist. Rediscover a time when a glass of soda cost a nickel and a good cigar was 5 cents. Hundreds of visitors to this museum have enjoyed seeing the original turn of the century oak and marble soda fountain, candy department filled with a collection of fine early candy jars and a pharmacy, all filled with historic treasure’s from this extraordinary private collection. Every curved glass showcase is filled with the real products of the past such as early tobacco, cut plug tobacco, gum packs, cures and medicines, high button shoes, collar buttons, men’s and women’s collars, etc. The oak wall fixtures are filled with colorful products such as tobacco, coffee tins, laundry products, dye cabinets, coffee bins, early spice tins, veterinary cures of every description and display cabinets advertising numerous products that the local farmer and town residents needed from day to day. This historic building was Mount Airy’s first Post Office. The original oak counter top from the Post Office is on display along with numerous other original fixtures throughout the building. Visitors will enjoy seeing many colorful advertising signs on display some dating back to 1880. We offer two floors filled with fancy spool cabinets, ribbon cabinets, floor counters, two wheel cast iron coffee grinders, large wooden coffee bins. See mannequins from 1865 with period clothing and a collection of advertising wall clocks from the 1880′s. Listen to a 1915 Nickelodeon and enjoy the period and friendly atmosphere of 1888. The Museum is located in the heart of downtown historic Mount Airy. Along with architecturally interesting buildings, you will find several locally-owned places to eat, unique shops, and plenty of free parking. Tours conducted by Curator and Proprietor Howard B. Parzow, Auctioneer, hparzow@aol.com. Admission Fee Charged, tours run one hour. 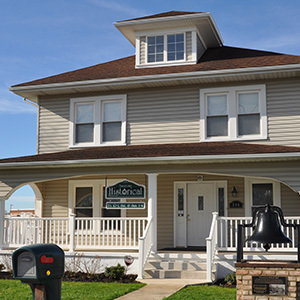 Complete your day with a visit to the Historical Society of Carroll County. The Society offers a taste of small city life in the 1800s in counterpoint to the agricultural life portrayed at the Farm Museum. The Historical Society campus encompasses three contiguous historic buildings on East Main Street in Westminster. The Sherman-Fisher-Shellman House at 206 East Main in Westminster is furnished to interpret the lives of the first owner, Jacob Sherman, and his family who lived in the house from 1807-1842. Behind the 1807 historic home is an inviting lawn and gardens. Costumed interpreters are on hand to guide your group through the house. The tour is appropriate for young people as well as for adults. The adjacent Kimmey House (c.1800) is home to the Shriver-Weybright Gallery where a self-guided museum tour provides a sense of what went into the making of Carroll County through the contributions of residents. School girl samplers from the 18th century, the tall clock collection, Rinehart sculptures, a Hammond grave stone, a cup and saucer owned by Francis Scott Key and much more draw visitors into the fascinating foundations of our county. Cockey’s, our third historic building, is a former inn and home built around 1820. Dentil molding, fluted pillars and other architectural details add grace and charm to the grand dame of East Main Street. The parlor display is set to the era of ownership by a prominent family in the late 1800s and early 1900s. Visitors to The Shop at Cockey’s find a treasure trove of unique items created in the county by artisans and authors. Local history and Civil War books abound, and there’s even a nook with children’s books and games from days gone by. The museum collection includes many pictures, old newspapers and newspaper clippings, books, clothing, home furnishings, business items, signs, tools and items distinctive to the town of Mount Airy. Opens mid April from 10:00AM to 4:00PM for the season and will continue to be open each Friday and Saturday from 12:00PM to 4:00 PM. Museum will be closed for the winter from December through March. Discover for yourself the intrigue of the past through the unique lens of local history. Historical displays, photographs, maps and artifacts.Open Saturdays from 9:00AM to 12:30PM. In the Wakefield Valley/New Windsor area of Carroll County, Robert Strawbridge formed the first Methodist class in America about 1763. Nearby, he built the first log meeting house. Although without official sanction, American Methodists first received Baptism and Holy Communion by his hand. The Strawbridge House was designated a National Methodist Shrine by the General Conference of 1940, and was purchased by the Strawbridge Shrine Association in 1973.Today the Strawbridge House and farm, along with John Evans Meeting House Replica, are available for tours. Please call ahead and make an appointment. The Sykesville Colored Schoolhouse Museum has been restored to its 1916 appearance. Built between July and December 1903, at a cost of $530.50, the building has lived many lives. Between January 1904 and May 1938 it was a one-room schoolhouse, managed by local community trustees, for children of the surrounding black community from both sides of the Patapsco River during the days of segregation. Between July 1939 and late 1981 the building served as a residence with its main floor divided into four rooms. Since 1982, the building was repeatedly slated for demolition, but was saved each time by the efforts of local residents.By the mid-1990′s, with support from the Town of Sykesville, the project was in line to receive state restoration seed grants. However, their implementation was delayed while deeds and other issues were resolved. Millennium celebrations provided a major boost in the effort to save the Schoolhouse. The White Millennium Council, in partnership with the National Trust for Historic Preservation, listed the Schoolhouse as a Save America’s Treasures Project, and the Maryland Commission for Celebration 2000 selected it as a statewide Treasure of the Month. The same year the Maryland House and Garden Pilgrimage selected the Sykesville Schoolhouse as the county and statewide beneficiary project for the year.This historic schoolhouse has been restored and furnished to its 1904 appearance, but today teaches area children of all ethnicities and ages. A variety of field trips and tours are available for students and Scouts ages kindergarten through grade 12. A nominal fee will be charged for each student. In addition, community organizations may rent the structure upon request.To schedule an appointment, contact Ms. Greenwald at 410-489-6540. Opening at its present location September 7, 1997, the Sykesville Gate House Museum serves as a destination for hundreds of visitors. The Museum strives to interpret the abundant history of the Town of Sykesville and its surrounding communities through its collections, exhibits and special events. Entering the front door, visitors will immediately immerse themselves in the rich history of this community through an innovative timeline. A wide variety of displays and artifacts located throughout the building provide more detailed aspects of the Town of Sykesville’s history. 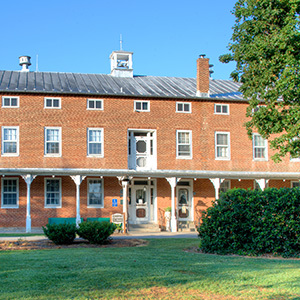 Historic home and architectural enthusiasts may opt to take the guided tour of the building’s other purpose – home to Springfield Hospital Center employees from 1904 until the late 1980s. You will be able to see how the Gate House gained its name as well as several of its unique features. Children will enjoy learning about the Shipley family, as well as the working antique telephone and attic filled with toys. The collection at the Museum began with Sykesville resident Thelma C. Wimmer’s photographs, both amateur and professional, capturing life in and around Sykesville over the past 140 years. Additionally, clothing, business ephemera, postcards, Native American artifacts, furniture and personal effects help to tell the story of an ever-changing community. Over the last 200 years, Sykesville has functioned as a small mill village and farming community, weathered a Civil War and two World Wars, charted new territory as a growing rail town, seen Victorian splendor as a summer-respite and acted as a bustling 20th century Main Street. Open Thursdays and Fridays, 1 p.m. to 5 p.m. and Sundays, 1 p.m. to 4 p.m and also by appointments. Closed on major holidays. The Taneytown History Museum is dedicated to the preservation of Taneytown's history, artifacts, memorabilia, and ephemera. The site itself is historic in that it once included a Hudson car dealership. Displays are housed in three rooms. The Taneytown Room traces the history of the town from the Native American presence to the 1940's. The products of local craftsmen are included, among which are firearms, pottery, furniture, and clocks. Of particular interest is the Eli Bentley clock donated by Kenneth and Doris Crouse. The display in the second room changes each year. Memorabilia from Taneytown High School, a photographic display and the Collector's Corner are in the third room. The Taneytown School bell from 1900 is permanently displayed in front of the museum. It was dedicated on April 2, 2017, in honor of museum founders George W. Naylor and the late George B. Crouse. Museum hours are April through November, Fridays 10 am to 1 pm, and Saturdays and Sundays, 1 to 4 pm. The hours may change to accommodate special Taneytown events and some holidays. Appointments for tours at other times may be made by calling 443-918-8687 or e-mailing ThandMA@gmail.com. Prints, postcards, pictorial throws, Amish brooms, Christmas tree ornaments and other items are for sale in the gift shop. Special events hosted by the museum are announced on the website. The Union Mills Homestead and Grist Mill are open for guided tours May and September weekends only noon to 4 pm. From June through August, it is open 10 am to 4 pm, Tuesday through Friday, and weekends noon to 4 pm. Closed Mondays. The guided tour of eleven rooms of the Homestead provides a chance to see beautiful American-made furniture belonging to one family for six generations (1797-1956). 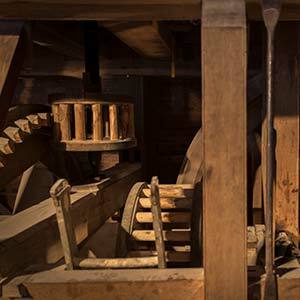 The restored Grist Mill gives demonstrations of grinding grain into flour by water power. The Grist Mill grinds stoneground whole-wheat, buckwheat, and cornmeal, all of which are available for purchase in the gift shop. The Homestead is known countywide for annual events: the Flower and Plant Market and Sale the first weekend in May, Civil war Encampment and Living History on the 3rd weekend of July. Ice Cream Sundae Social the second Sunday in July, the Annual Old-Fashioned Corn Roast Festival the first Saturday in August, and the Maryland Microbrewery Festival the last Saturday in September. The museum houses an extensive collection of Western Maryland Railway artifacts and memorabilia, a voluminous photo archive, archival material directly from the Western Maryland, and an extensive railroader’s library featuring historical and technical publications about the Western Maryland and the other roads of the region. Free admissions, donations are welcome. Call for hours of operations.